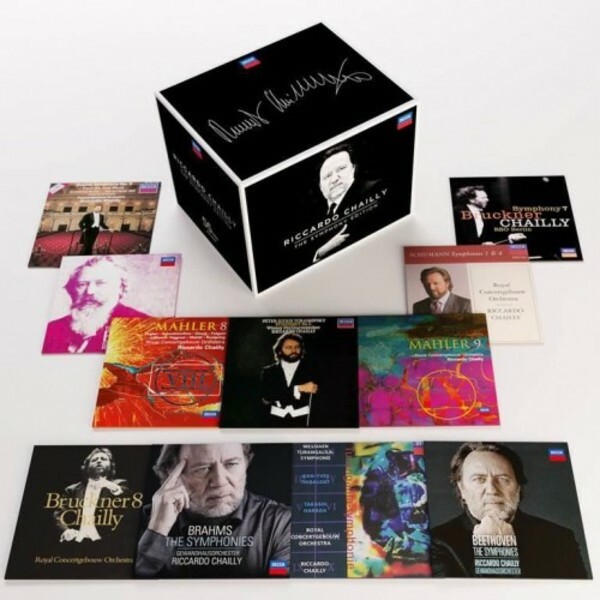 55-CD original jacket, original couplings collection celebrating Maestro Riccardo Chailly’s 40 years on Decca; includes complete cycles of Beethoven, Brahms (x2), Schumann (x2), Bruckner and Mahler. Riccardo Chailly was born into a musical family in Milan. He studied at the conservatories in Milan and Perugia and received specialized training in conducting from Franco Ferrara at his Siena summer courses. At the age of 20, Chailly became assistant conductor to Claudio Abbado at Milan’s La Scala. He made his opera debut there in 1978 and was soon in great demand at the world’s leading opera houses and concert halls. His recorded repertoire ranges from the music of Bach and the great classical symphonic and operatic works to contemporary compositions. Chailly’s ‘symphonic’ career can be broadly described in three chapters: his first major post was with the Berlin Radio Symphony Orchestra (now the Deutsches Symphonie-Orchester Berlin) from 1982 to 1988. Then in 1988, he moved to the great Concertgebouw Orchestra in Amsterdam (the ensemble gained its ‘Royal’ prefix during his tenure there) where he stayed until 2004. In 2005, he moved on to the venerable Gewandhausorchester in Leipzig, an ensemble to which he’d been introduced nearly 20 years earlier by no less a figure than Herbert von Karajan who maybe discerned in his young Italian colleague a fascination with tradition and the challenge of re-energising it in a modern age. In 2016, in a move that had a real inevitability about it, he announced his departure from Leipzig to return to his spiritual home and take musical charge of La Scala, Milan. An exclusive Decca artist for over three decades, Chailly has held a fascination with how you keep a tradition alive yet invigorate it and evolve. His recordings reflect the traditions of the great orchestras he has led while embracing the necessity to inhabit the presence, bringing a freshness and vigour to familiar works without concession to established performance styles; to listen anew.